One of the most appealing things about Michelle Obama is her closeness to her mother. Some people might think it is strange or even pathological to bring your mother with you to the White House. Certainly, no one has done it since the Trumans, and no one at all seems to have done it as joyfully and naturally as the Obamas. 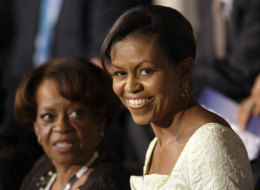 While many modern women have prickly or distant relations with their mothers, Michelle reportedly begged her mother to come with the family to Washington. Then she fielded out the manipulation to the most skillful and powerful manipulators, the 10-and-unders, saying, "All they have to do is look at her with sad eyes and she's done for." Mrs. Robinson responded the way any self-respecting American grandmother would: I don't want to intrude. But isn't it a sign of an extremely healthy mother-daughter relationship that she did anyway?